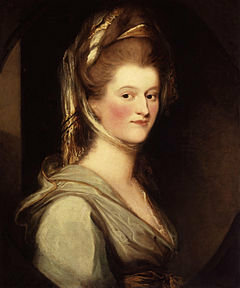 The Beautiful Lady Craven is the title of the edited and annotated memoirs of Elizabeth Craven (née Lady Elizabeth Berkeley) (1750 - 1828), English author, playwright, traveller, and socialite, best known for her travelogues. In England she was a friend of prominent literati of the day, including Dr. Johnson, Boswell, and Walpole. She wrote her memoirs in Naples, where they were published in 1826. The edited version was in two volumes and was published in 1914. * Her married name derives from her husband, William Craven (1738-91) 6th Baron Craven. They married in 1767 and separated in 1780. Thereafter she lived in France and traveled extensively on the Continent. For a number of years she was in a relationship with Alexander, Margrave of Brandenburg-Ansbach and Bayreuth (1736-1806) (a cousin of George III of Great Britain). Elizabeth and Alexander were married in 1791. The King of Naples made me a present of two acres of land, on a most beautiful spot of ground, commanding a complete view of the bay. Here I built a house, in form similar to my pavilion at Brandenburgh House; a large circular room in the centre, with smaller apartments surrounding it. The Duchess of Devonshire, and many of our English nobility, resided at Naples; and the high esteem in which I was held at court, rendered my life extremely agreeable. The Treaty of Vienna restored Ferdinand I to his dominions, but he returned to Naples a widower. Was it possible that the Margravine [ed.note: Elizabeth Craven] contemplated the possibility of becoming Queen of the Two Sicilies when she returned to the scene of her social triumphs of 1789? On the subject of her final return to the beautiful Italian city of which she had written with so much enthusiasm she is absolutely silent, but we know that il vecchio Nasone [ed.note: King Ferdinand] was not unmindful of his former friendship, and a warm welcome was accorded to the well-dowered widow of the dead Margrave, who had decided to turn her back on an ungrateful and unappreciative country and make Naples her home. Ferdinand IV was in his person tall and muscular, active in his undertakings, capable of undergoing immense fatigue, and, to all appearance, formed for a long life. His nose was immoderately long, like that of his father...His features were coarse and harsh; yet the general expression of his countenance was rather intelligent, and perhaps even agreeable, although, separately taken, every feature was ugly. His conversation, his deportment, his manners, were, from an unpolished simplicity, rude in their nature, though rather pleasing; as they removed from the mind what is always to be expected from a sovereign,—that habit of disguise, artifice, and concealment, which accompany the possessor of a throne. If he did not converse much with strangers, yet he always appeared to say what he thought; and, although destitute of art or elegance, he did not betray a want of understanding or of information. He reminded me of a rustic elevated by accident to the crown; but then it was an honest well intentioned countryman, not entirely unworthy of such an honour. The term "villa" is ambiguous. It can mean a single building, usually somewhat of a stately mansion, or it can mean the building plus the surrounding property. In the case of the villa Craven (photo, center right), we mean the building in the center of the property plus the wooded area above and to the right. In any event, Elizabeth's property was spectacular and still is. It faces due east to the sunrise, Vesuvius, the Sorrentine Peninsula, and it has a fine view of Capri. The original premises—i.e. the entire villa Craven—included everything to the right of the main building all the way to the edge of this photo. The nucleus of the property appears as the palazzo of Gironimo Sizzano on the Baratta map of 1629. The property changed hands a few times in the 1700s before Elizabeth acquired it and built her villa. All sources describe the premises as lush, idyllic and commanding a beautiful view of the bay. Elizabeth Craven died in 1828. (She is buried in the English Cemetery in Naples). In 1834, Domenico Gallotti bought most of the property, with his part centered on the original villa Craven. 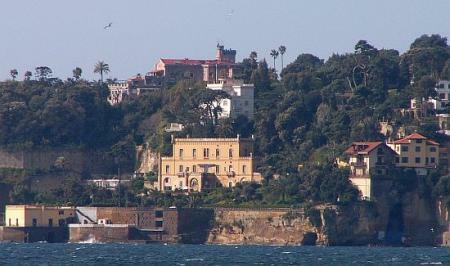 The adjacent section (on the far right in the photo, the part with newer buildings) contained the original entrance to the Craven premises from the road above (via Posillipo) but has since had its own separate history; it was sold in 1876 and became known as villa Travesri after the new owner. In 1907, that property was acquired by Roberto de Sanna, who called it Villa Maria (which name is still at the entrance at via Posillipo 52. He sold it in 1924 to Charles James Rae, owner of the Gutteridge shop in Naples. That part of the original premises remains in the possession of the Rae family. Thus, there are now two separate gated entrances to the original premises: via Posillipo 52 (villa Rae) and via Posillipo 54 (villa Gallotti). Today, if you travel up the street, via Posillipo, from Mergellina, there is still a string of such properties along the left as the hill slopes down to the sea. They are all walled off from the chaos of the street and the rest of Naples. They almost all have small docks and access to the sea. They all have fortress-like gates at the top that you cannot pass. (You can, however, wait for a car to drive out, watch the gates slowly open —as celestial music rings forth from above!— and sneak a peek!) They are generally subdivided now, such that more than one family will live in what once used to be a single-family residence. You can get a taste of the area by driving down to the Villa Volpicelli at water's edge at the little harbor of Riva Fiorita not far from the Villa Craven (out of sight to the left in this photo) and looking back towards the city. Portrait at top is by Ozias Humphry (1742 – 1810), a prominent English painter of portrait miniatures.